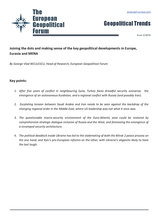 Since August 2010, the EGF Turkey File has chronicled current events in Turkish security, politics, and business. It covers news and then delves deeper, providing insights into regional players, analysing cause and effect, and giving an outlook for geopolitical consequences in the region and beyond. 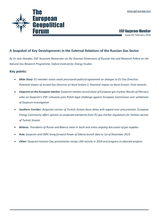 The EGF Gazprom Monitor monthly bulletin was launched in November 2011 to provide a snapshot of key developments in the Russian Gas Sector with the focus on the major state run market player, Gazprom. Geopolitical patterns of the Russian gas giant's activities are reviewed and analyzed, with insider knowledge and coverage of issues ranging from political motivations to the latest cross-border transit volumes. 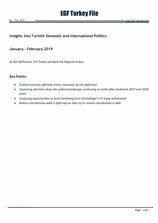 The EGF Geopolitical Trends is our newest monthly product, aiming to fill the gap in the complex, multi-optional coverage of key geopolitical trends in Europe, Eurasia and MENA. It joins the dots and makes sense of key geopolitical developments, linking specific events to broad trends and movements to help the reader understand the region's most significant issues. Given the complexities and present-day dynamics of the Eurasian gas markets, we at the European Geopolitical Forum felt it necessary to provide, in addition to the monthly Gazprom Monitor reports, a high-level yearly summary. We feel the additional perspective and analysis made possible through this extended format will be invaluable for policymakers, business leaders, and other interested stakeholders. 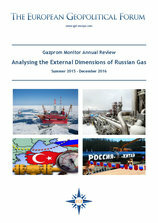 As with our monthly Gazprom Monitor, this Annual Review will focus on Gazprom's external activities, with particular reference to the EU gas market, the Nord Stream and South Stream export pipelines, Gazprom's relations with Naftogaz Ukraine in the context of Russia-Ukraine relations, and the competition Gazprom faces regarding Russia's LNG exports. We also provide analysis on the "eastern dimension" of Gazprom's business. EGF Affiliated Expert, Mikhail Roshchin, is a regular commentator for the Russian Lifenews TV channel on Syria and ISIS. You may watch his interviews (in Russian) on the recent meeting of presidents Putin and Obama in New York here, on the Kurdish war in Turkey here, and on the threat of ISIS here.